The Festive Amazon (Amazona festiva Linnaeus, 1758), member of the order of the Psittaciforms (Psittaciformes), of the family of the Psittacids (Psittacidae) and of the genus Amazon (Amazona), is a bird whose biology, in the wild as well as in captivity, is not much known. The common name in German is Blaubart-Amazone, in French, Amazone tavoua and in Spanish, Amazona festiva. 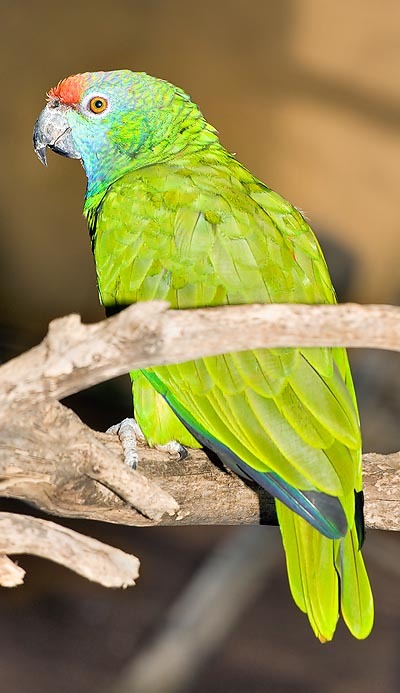 There is no ongoing debate at systematic level for this species; it would seem that there is a common agreement between the International Commission for Zoological Nomenclature (ICZN) and the Birdlife Society, in subdividing this nominal species into two subspecies: the Amazona festiva festiva and the Amazona festiva bodini. Generally speaking, the two subspecies have a biology common to the nominal species, even if in the case of the Amazona festiva bodini, some peculiarities of morphological and ethological order are more marked as we shall see; a first difference, however, stands already in the common denomination in the German language that for the Amazona festiva bodini is Bodinus Amazone. The Amazona festiva has a distribution going from eastern Colombia to central Venezuela, along the Orinoco River up to the Rio Meta and in north-western Guyana. The Amazona festiva bodini, on the contrary, is not so common in Venezuela, as it seems to be more sensitive to the continuous phenomena of deforestation present in this nation, which are destroying its habitat, not to forget the action of the poachers for its sale as ornamental bird. Nowadays, it is found only in eastern Colombia, along the Orinoco River up to the Rio Meta and, rarely, in north-eastern Guyana. Last, the Amazona festiva festiva results distributed in the eastern part of Ecuador, in north-eastern Peru and in south-eastern Colombia, in particular from the area east of the Amazon Basin, up to the lower Rio Madeira. In their geographic areas, the parrots of the nominal species, as well as those of the two subspecies, colonize equivalent habitats and biotopes. They prefer pluvial forests, where they carry on an arboreal life, but also the secondary vegetation along the banks of the Amazon River and relevant tributaries. These birds tend, however (and this has rendered difficult their study in the past and still now) to colonize also small areas of forest, present on islets, trapped in the complex network of river courses of these regions. Furthermore, they love also to live in the permanently flooded forests as well as in those seasonally flooded, present close to the banks of the Amazon River and the Orinoco. For instance in the forest of Igapò, which is a pluvial forest regularly flooded, for several months of the year during the rainy season; some tropical biologists, for this reason, prefer to indicate it as a permanently flooded pluvial forest. The best known of such forests is located in the basin of the Amazon River, where it forms about the 2% of the total pluvial forest. The trees of the Igapò are lower than those of the non-flooded forest, due to the instability caused by the wet and little drained soils; this so marked phenomenon, at times grants them the name of “swamp forest”, similar to that of southern Florida, and is characterized by some species of trees of the genus Cecropia, Ceiba and the palms of the genus Mauritia. On the other hand, as a seasonal flooded forest, we have the Virzea or Varzea, which is a type of tropical pluvial forest, present in the floodplains, subject to heavy rainfalls, but markedly seasonal, contrary to the Igapò. Furthermore, unlike the swampy forests, as is the case of the Igapò, the forests in Varzea have a very fertile soil, due to the abundant quantity of nutrients they get from the white water rivers; in this context, the Amazon River (as the Igapò forest as well as the Varzea, do exist only in South America), this fertility of the soil, endangers them as these soils are more and more exploited by the agriculture, and for this reason they are cleared. The green is the prevailing colour of the plumage. The feathers of the nape are bordered by a slight black colouring. The flight feathers are bordered by a green-yellowish colour, a thin dark red band marks the front. The chin and the surface over the eye do have a blue dot, the cheeks are yellowish-green, the low part of the back is marked by a scarlet red dot. The edge of the wings is yellowish-green; the coverts are violaceous-blue. The tail is green, with greenish-yellow tips. The periophthalmic ring of skin is grey, the pupil is grey too, the iris orange-red. The zygodactylous feet are grey. The pullets and the immature individuals have a weaker colouration on the head. Some of the outer rectrices have a red base in the immature; the iris is dark. Both the Amazona festiva and the Amazona festiva festiva have this sort of livery. In the Amazona festiva bodini the yellow plumage is more present and the scarlet red dot which originates from the lower part of the back, extends up to the top of the head. The nape and the upper part of the skull are slightly coloured of lilac, the cheeks are suffused with blue, the primary coverts are green. The periophthalmic ring is dark grey, the pupil is black. In the nominal species as well as in the two subspecies, there is no phenotypic sexual dimorphism between the two sexes, neither seasonal transitory, nor permanent. All individuals are about 34 cm long and weigh 300-350 g with longevity, in the wild, of about 40 years. They are quite rare in captivity, therefore the knowledge about the breeding especially of the subspecies Amazona festiva bodini, are poor. The CITES strictly prohibits its trade and the IUCN has inserted the nominal species and also the two subspecies in the red list of the species with extreme risk of extinction. These parrots, typically monogamous, live in isolated pairs as well as in small groups, occasionally, very crowded in the feeding areas, on the branches of the big trees, rich of the fruits they nourish of. The ornithological biologists who study them meet major difficulties in finding and following them, due to the particular chromatism of their plumage which perfectly camouflages them between the tops of the trees, whilst they are more easily observable when flying. By late afternoon, bog crowds form on the resting trees, utilized as perches, ready to quickly disappear at the first suspicious sound. The cries are noisy and metallic. 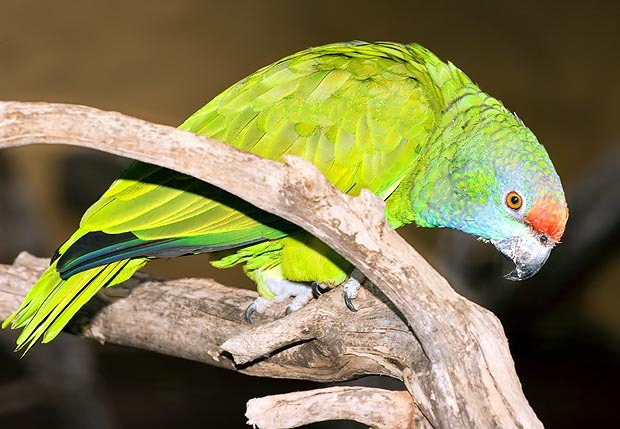 The race Amazona festiva bodini is subject to seasonal migrations, and has been sighted, at times, in north-western Guyana. They eat fruits, soft fruits, seeds, nuts and buds of growing leaves. They are tireless chewers. They are moderately noisy parrots, even if the Amazona festiva festiva may be somewhat chattering. Initially, they are shy with the man, and then soon become very sociable. They have a calm temper, and quite rarely they may get excited and aggressive. There is no clear information about their reproductive biology. Some authors think that they lay 2-3 eggs in the hollows of the trees, and this between November and March.